Stay at Kamaole Beach Royale for your Maui vacation, where you’ll experience the island lifestyle. Palm trees swaying in the breeze surround the Resort Hotel. At your disposal is everything you could ever need to relax during your island getaway. At this vacation rental, there is no need to worry about parking or traveling far to reach the beach. Condo units for rent are fully equipped with air conditioning, a full kitchen, washer and dryer machine, flat screen TV, telephone and wireless Internet. The 3 bed, 2 bath unit includes 3 queen beds and one sofa bed to comfortably fit up to eight people. Condominium accommodations also come with everything you need for the outdoors including beach chairs, towels, a cooler and boogie boards. 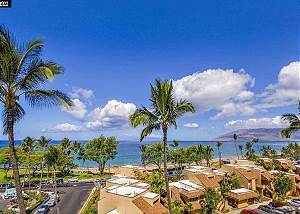 Kihei is a compact town nestled along six miles of beach. When it comes to getting around Kihei, you can easily walk from Kamaole Beach Royale to many shops, restaurants and beaches. Roaming around is encouraged! It is also a short drive away from several famous golf courses. The Resort is sandwiched between the Kihei Maui Nui Golf Club and the Wailea Blue Golf Course. The Kamaole Beach Royale Resort is also adjacent to the Kihei Boat Ramp where many tours depart. Boat tours can also depart from Maalaea Harbor, only a short drive north. Kihei is home to superb surfing, snorkeling and paddle boarding. The best surfing and paddleboarding, perfect for beginners, can be found nearby at the Kalama Beach Park. The best snorkeling, arguably on the island, is found south of Kihei at La Perouse. Here fishes and turtles swim in a protected reserve. Sometimes you may even spot a reef shark! The ease provided by staying at the Kamaole Beach Royale will make your Hawaiian vacation one to remember. With an ideal Maui location and all the living amenities you need, all that’s left to do is relax and explore all the island has to offer. Bring your family and friends to join us at the Kamaole Beach Royale where you can experience the trip of a lifetime on Maui!